If a summer in Atlanta wasn't hot enough, V-103 Atlanta and Anthony Wilson, Chris Brown’s longtime manager, is bringing the Tycoon Music Festival to the Cellairis Ampitheatre on June 8th. They are bringing together the Biggest Influencers in Hip-Hop and R&B for this generation. 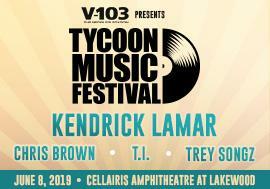 Kicking off the Tycoon Festival are GRAMMY® Award Platinum recording artists Kendrick Lamar, Chris Brown and Grammy Nominated R&B Artist Trey Songz live on stage. These artists are powerhouses in their own right in music, film and business and this festival will bring all of their artistry to the stage June 8th at Cellairis Amphitheatre at Lakewood.